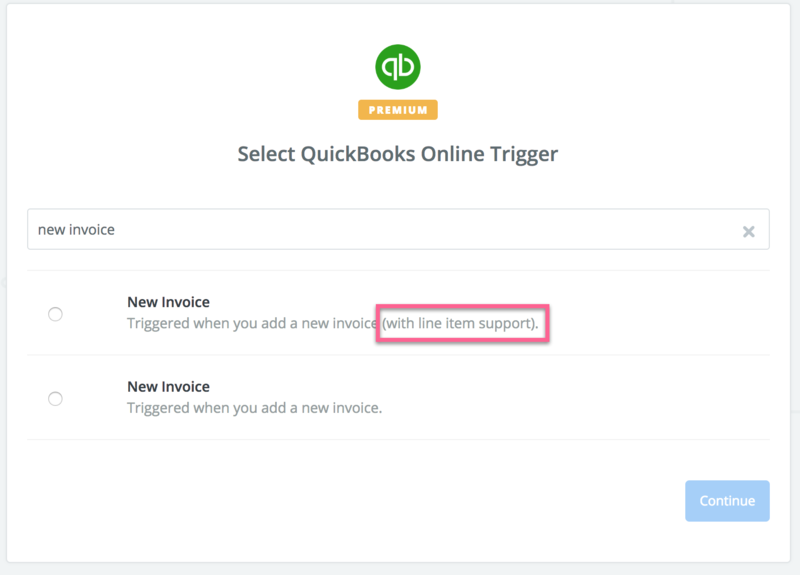 What Quickbooks Triggers and Actions are Supported? New Payment - Triggered when a payment is received (with line item support). New Purchase Order - Triggers when a new purchase order is added. New Vendor - Triggered when a new vendor is added. New Estimate - Triggered when you add a new estimate. New Customer - Triggered when you add a new customer. New Account - Triggered when you add a new account. New Sales Receipt - Triggered when a new sales receipt is added (with line item support). New Bill - Triggers when a new bill is added. New Sales Receipt - Triggered when a new sales receipt is added. New Invoice - Triggered when you add a new invoice (with line item support). New Expense - Triggers when a new expense is added. Create Journal Entry - Creates a new journal entry. Create Bill (Account Based) - Create a new bill, optionally tied to a customer (with line item support). Send Invoice - Send an existing invoice. Create Refund Receipt - Creates a new refund receipt. Create Purchase Order - Creates a new purchase order. Create Bill (Item Based) - Create a new bill, optionally tied to a customer (with line item support). Create Credit Memo - Creates a new credit memo. Create Vendor - Adds a new vendor. Create Time Activity - Creates a new single time activity. Send Sales Receipt - Send an existing sales receipt. Create Estimate - Create a new estimate (with line item support). Create Payment - Creates a new payment, optionally linked to an invoice. Create Customer - Adds a new customer. Create Sales Receipt - Adds a new sales receipt (with line item support). Create Bill (Item Based) - Create a new bill, optionally tied to a customer. Update Invoice - Updates an existing invoice (with line item support). Create Product/Service - Creates a new product or service. Create Invoice - Adds a new invoice (with line item support). Create Expense - Creates a new expense using check, cash, or credit card. Find Customer - Find a customer by name or email address. Find Vendor - Find a vendor by name. Find Invoice - Find an invoice by number. The pop-up would disappear and you will see your QuickBooks Online account added to your Zapier account and is ready for selection. 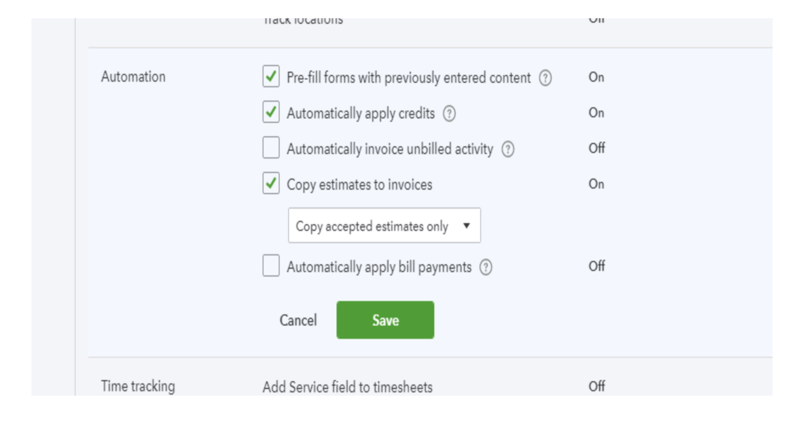 In Zapier's Quickbooks integration, the “New Sales Receipt,” “New Invoice,” and “New Payment” triggers offer line item support, as do the “Create Bill (Account Based),” “Create Bill (Item Based),” “Create Estmate,” “Create Sales Receipt,” “Create Invoice,” and “Update Invoice” actions and the “Find Product(s)” search. At this time Zapier does not support the desktop version of Quickbooks. 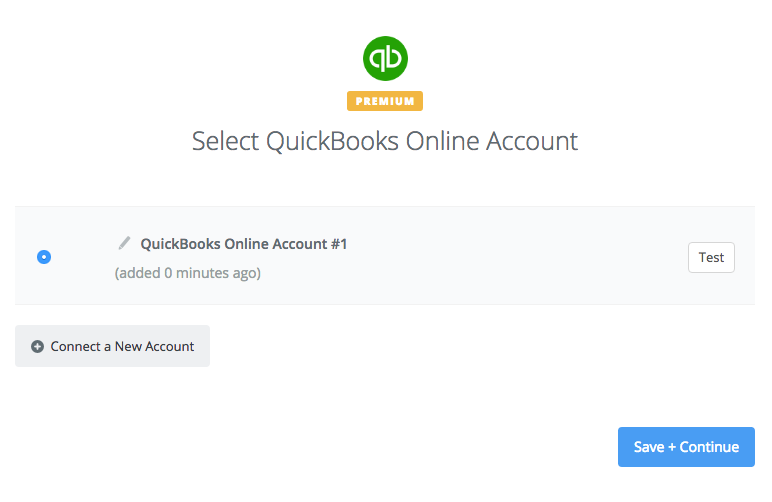 We only support Quickbooks Online (or QBO for short!). It's not possible for us to access the desktop version, but converting to QBO from desktop is a fairly painless process. 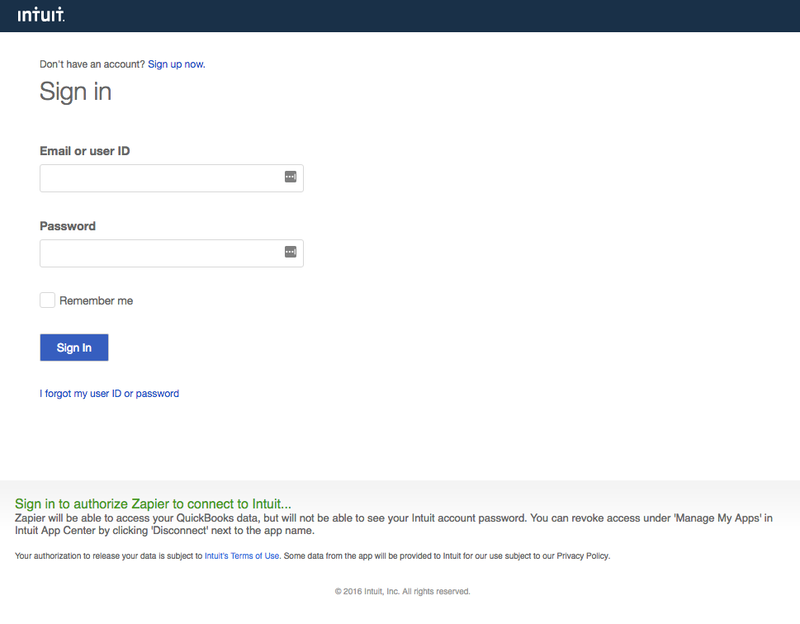 At this time Zapier does not support the Self-Employed version of Quickbooks Online. If you are currently on the Self-Employed plan and want to use Zapier, you can upgrade to a full Quickbooks Online account. Zapier uses the Display Name as a unique handle for finding customers inside of Quickbooks. If you attempt to create a new customer, employee, and vendor that reuses an existing Display Name you will experience an error. 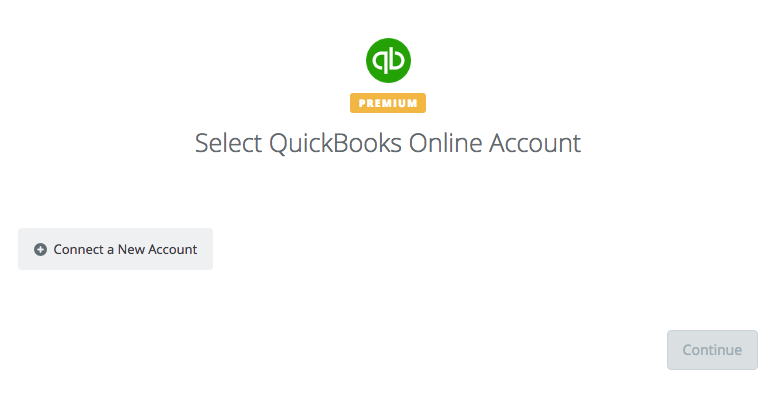 Because of the way Intuit bills for connections into Quickbooks, we're unable to provide this application under free or non-trial accounts. If you upgrade to a paid Zapier plan you will have full access to Zapier and Quickbooks! Uncheck the box "Automatically apply bill payments." If you are running into issues with unsupported fields, you may be using an older version of Quickbooks. 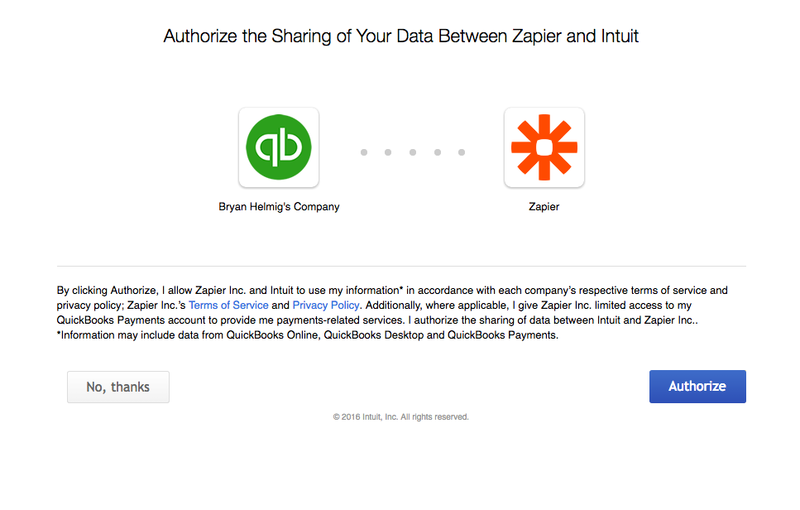 Zapier uses V3 of the Quickbooks API. If you are using a newer version and still getting this error please drop us an email and we can take a closer look. If you get this error, you'll need to disconnect Zapier from your Quickbooks account, then try reconnecting. To do this, click on "Apps" from the lefthand navigation inside of your Quickbooks account, then choose, "My Apps", then, "Manage my Apps". Delete the Zapier connection and then try connecting your account through your zap again. If you continue to run into this issue, email contact@zapier.com and we can attempt to force delete the connection. SKUs are set on the product and cannot be manually written to the invoice, so that's why this field is unavailable. If you select the correct Line Item/Product, then the SKU will automatically pull in to the invoice. When using "Create Sales Receipt" action, the "Deposit To Account" specifies a deposit account where the customer's payment is deposited. For this field, QuickBooks' only accepts account types "Other Current Asset" or "Bank". QuickBooks didn't yet have that email address on file and returned the 'list index out of range' error. To fix this error, you need to add another QuickBooks step before this: Find or Create Customer. This will ensure that a customer record is created for QuickBooks to find in the next step. Check to see if "Shipping" is turned on in the company's Quickbooks settings under the "Sales" tab. Switching that ON should fix the issue.